The Hyundai Genesis Coupe follows the traditional sport coupe formula set by its American and European competitors. It’s a lean rear-wheel-drive two-door with a big V6 engine, serious handling hardware, and aggressive styling that loudly declares its performance potential. The Genesis Coupe also goes beyond the basics, providing a near-luxury driving experience when you want it. All 2016 Genesis Coupes are powered by a 3.8-liter V6 that lays down 348 horsepower and 295 pound-feet of torque. A 6-speed manual transmission comes standard, and you can opt for an 8-speed automatic with paddle shifters. The current design has been with us since the model’s 2010 debut, but the Genesis Coupe received a significant refresh for 2013 that included more power, styling updates, and a vastly improved interior. For 2016, Genesis Coupe receives a larger central dash display with color graphics. The Genesis Coupe is EPA rated at 17/25 mph City/Highway, or 19 mpg Combined. Sport coupes like the Genesis Coupe have made a comeback of sorts in recent years, and there’s plenty of fine examples in this class. The scrappy Subaru BRZ and Scion FR-S twins occupy the lower end of the market, while the legendary Ford Mustang and Chevrolet Camaro are in the middle. A fully loaded Genesis pokes into the same league as the compact BMW 2 Series. The Genesis Coupe ($26,950) comes with cloth upholstery, automatic climate control, split-folding rear seat, keyless ignition, satellite radio, 18-inch wheels. R-Spec ($29,999) adds 19-inch wheels with summer tires, firmer suspension tuning, larger Brembo brakes, a limited-slip rear differential, and sport seats with leather accents. Ultimate ($34,950) gets the R-Spec’s performance goodies, plus a sunroof, leather seating, navigation, a premium Infiniti sound system, and other interior upgrades. 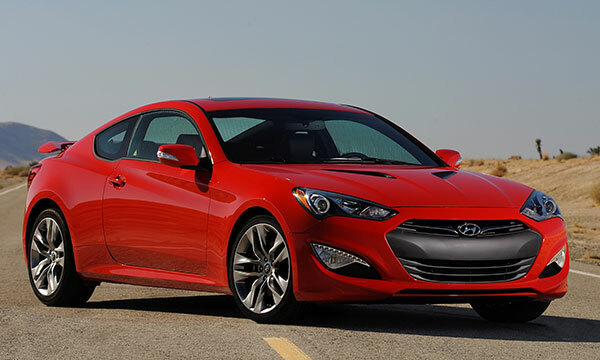 The Genesis Coupe incorporates many of the styling cues found on Hyundai’s compact and midsize cars. Its overall shape is typical of rear-wheel-drive sport coupes: longish hood, prominent rear wheels arches, and a sleek fastback roofline. The stance is low and wide. Up front is an all-black grille and matching lower air dam. Fog lamps and LED running lights complete the aggressive front end. A deep character line on each side runs from the top of the front wheel opening to the rear deck. Although it resembles a hatchback, the Genesis has a conventional trunk in back. The opening is flanked by rather conservatively styled LED taillamps. Slide behind the wheel and you’ll find a practical cockpit with a hooded instrument cluster and neatly arranged center stack. Soft materials cover most surfaces, and there’s a layer of piano-black trim throughout. The available sport seats have prominent side bolsters to keep you firmly in place. There’s enough room in front to make the Genesis a very comfortable tourer for two. Getting into the back is fairly easy thanks to the long doors and flip-forward passenger seat. Once there, adults will have to swing their knees to either side, a position no one wants to hold for long. Headroom is equally dicey. On the upside, the trunk can handle a weekend’s worth of luggage for two, and the rear seat folds flat to make a useful cargo shelf. The center storage bin is big enough for a purse or tablet. With its leather seats and door trim, the Ultimate model feels more like a luxury coupe. It also gets stylish touches like metallic trim, illuminated door sills, and aluminum pedals. With 348 horsepower at its disposal, the Genesis Coupe can run alongside far more expensive sport coupes. The V6 takes off in a fury and delivers a deep and satisfying exhaust note. Zero to 60 mph happens in a tick over 5 seconds. The 6-speed manual transmission offers a crisp, sporty feel and precise shifts, although the throws might be a little long for some drivers. The 8-speed automatic is sometimes reluctant to downshift, and models so equipped can feel sluggish by comparison. This issue goes away when you switch to manual mode and shift using the steering wheel-mounted paddles. The standard suspension provides a nice balance of road grip and ride quality. Handling is of course the top priority, but the Genesis is capable of a delivering a pleasant, quiet ride when all you want to do is cruise. The hydraulic power steering feels as good as any in this class. Rear visibility is better than many sport coupes, but some drivers will wish for blind spot monitoring to assist with lane changes, a feature that isn’t offered. With their firmer suspensions, the R-Spec and Ultimate models can tackle curves at higher speeds and with greater precision. The downside is a heap of road noise and a rather jittery ride. If you’re looking for a well-rounded touring car rather than a sportster, the base model will serve you much better. The Genesis Coupe has matured into a fairly practical, sufficiently refined coupe that can still perform with the gusto of a teenager’s dream car. In all forms, it offers plenty of thrills and a premium feel that you don’t always get in this price class. This balanced approach will resonate with drivers who want a pulse-quickening car that they can live with every day.